Tracey loves to teach, and her students have placed well locally and nationally. Her students have earned the Bronze, Silver, and Gold USDF Rider medals. Also, many of her students have gone on to make teaching and training horses their profession. Over the years, her students have placed well at all levels in both CDS and USDF Finals and end of the year award programs. Tracey has been fortunate to work with many good trainers and instructors. She was started in her riding by her parents Peter and Bonnie Lert. As one of the early driving forces behind dressage in the United States, Peter was a well-respected breeder, trainer and judge as well as a recipient of the USDF Lifetime Achievement Award. 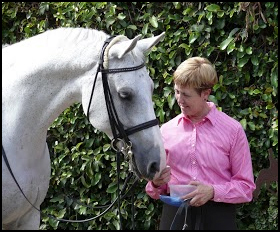 Growing up in the Lert family, it was only natural for Tracey to become a dressage trainer. She participated in Pony Club throughout her childhood and her background includes jumping and cross country riding. She has worked in clinics with Conrad Schumacher, Gabriella Grillo, Harry Boldt, Anders Lindgren, Kyra Kyrklund, Robert Dover, Lilo Fore and David Hunt. Tracey currently bases her training program at Sandy Howard's American Sporthorse in Watsonville, CA. 1989 Selected for North American Dressage Championships in Quebec, Canada. Placed fifth in Intermediaire Freestyle. a USDF Symposium with Kyra Kyrklund and Eric Lette.